Huawei is expanding its retail presence in the UAE with its third store in Dubai opening at the Mall of the Emirates today. 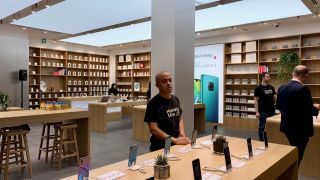 The new store is based around Huawei's Intelligent Life concept that was introduced in China and is making its way across the globe. David Wang, UAE Country Manager, Huawei Consumer Business Group, said: “The United Arab Emirates is essential to Huawei's retail expansion strategy and Huawei’s goals of global leadership in the industry. We are proud to shape the retail landscape for consumers in the UAE with the launch of the flagship HES in Mall of the Emirates." According to Huawei, the store is a comfortable futuristic space inspired by nature and allows customers to have hands-on experience and explore the latest technology innovations from Huawei. The stores will house Huawei’s achievements in Artificial Intelligence and showcase all of the latest devices such as the HUAWEI Mate 20 Pro, HUAWEI Watch GT, the Matebook X Pro and other products including tablets, fitness trackers and connected accessories.